Aesthetix is the brain child of engineer and music lover Jim White. Avid concert-going from the age of 10 and a well read subscription to Stereophile at age 13 were the early hints of what would become a life consuming obsession with music and vinyl playback. After advanced studies in physics, mathematics and electrical engineering, Jim began honing his skills in 1990 at Theta Digital. His contributions to the Theta Casablanca and Dreadnaught were his first examples of outstanding design. Analog remained Jim's true hi-fi passion, and in 1993 work on a massive tube phono stage began in his garage. Audiophile friends who heard the first homemade unit urged him to build more and thus Aesthetix was born. 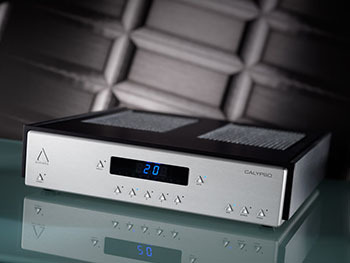 Calypso is an all-tube linestage suitable for audio and home cinema systems. Fully balanced circuitry from input to output, including internal balancing of single-ended inputs, results in common mode signal rejection and cleaner sound. The innovative discrete switched resister volume control maximizes resolution at any listening level. Every input is both single-ended and balanced for greater versatility. Home theatre bypass mode, absolute phase setting and full function remote are added conveniences. The all-aluminum chassis is rigid, acoustically inert and simply beautiful. Janus is a full-function all-tube preamplifier with six line level inputs and one phono input. Janus represents the key features of Rhea phono stage and Calypso linestage combined into a single chassis. All tube amplification and output, a fully balanced linestage, discrete switched resistor volume control, versatile single-ended and balanced inputs and outputs, and dual-mono audio boards are all part of Janus. The full function remote controls all preamp and phono functions, including gain, loading, absolute phase and the internal demagnetizer. True to its Saturn Series heritage, the build and sound quality of Janus have won it global praise, including 2010 and 2011 TAS Editor's Choice Awards. 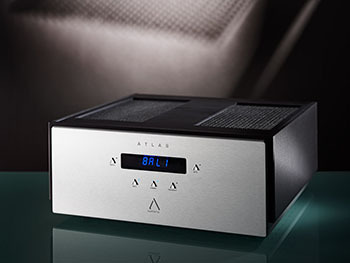 ATLAS amplifiers are capable of driving virtually any high quality speaker. An innovative hybrid design incorporates a bipolar output stage, bipolar driver stage, and vacuum tube input gain stage. They stand alone as the only hybrid amplifiers with zero feedback, essential for maintaining harmonic integrity, air, space and coherence. The Atlas provides your choice of full range or high-pass inputs. This unique built-in filter is ideal for speakers featuring powered woofers, such as Vandersteen, or for audio and home cinema systems using outboard powered sub-woofers. Saturn Series design themes are evidenced in the specialized all-aluminum chassis construction and elaborate power supply design.